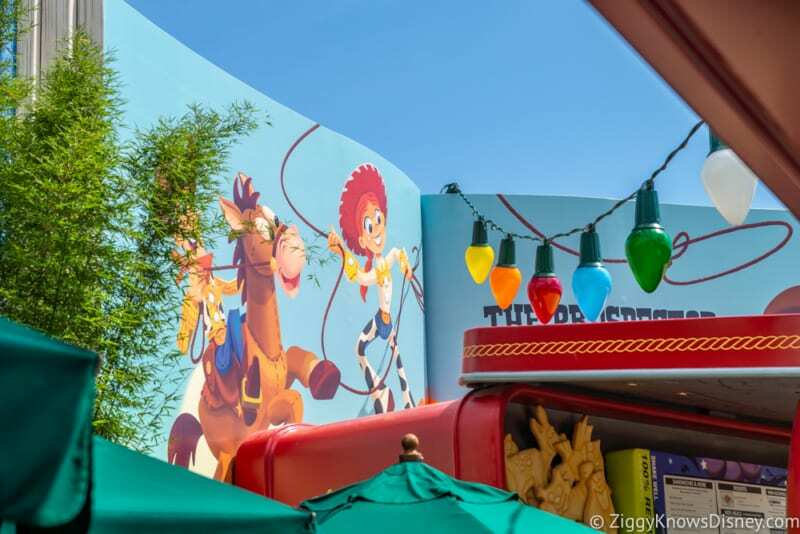 This is Woody’s Lunch Box Review in Toy Story Land in Disney’s Hollywood Studios. 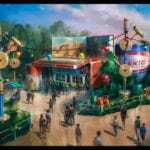 We couldn’t be any more excited for the opening of Toy Story Land and getting to try all the new attractions. Ok, trying the food would be even better. 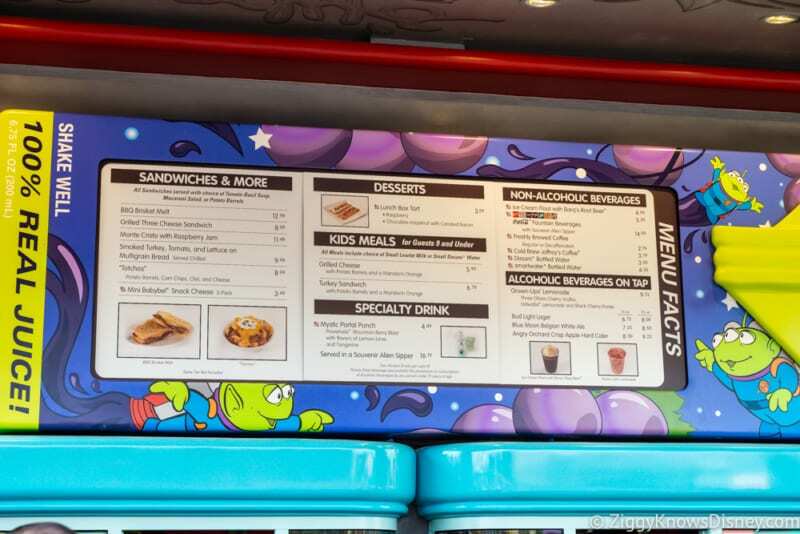 Back a few months ago when Woody’s Lunch Box released its menu the whole thing had us really intrigued to try it out and now we had the chance. 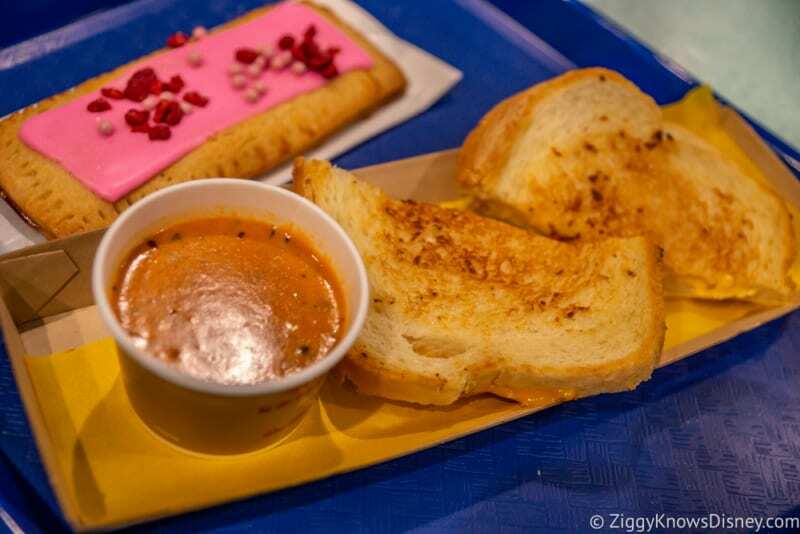 Woody’s Lunch Box is a Quick Service restaurant and the concept of it is quite interesting. 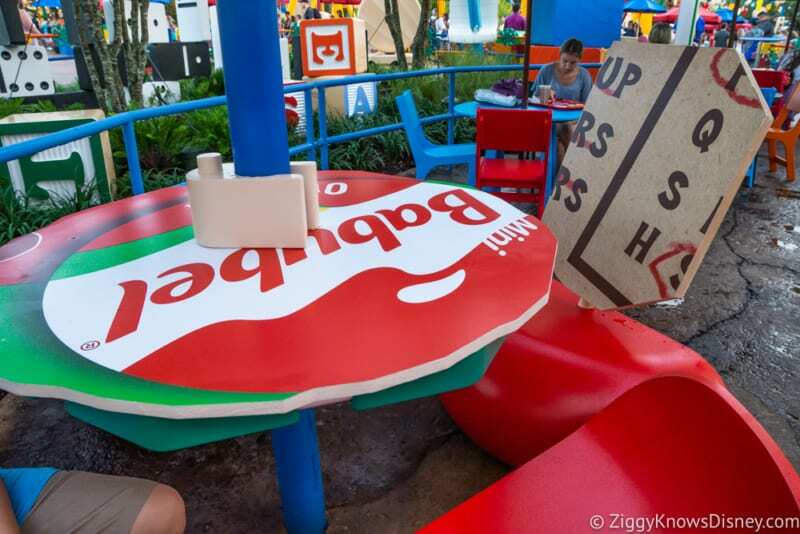 Essentially Andy setup his lunch box in the backyard and it’s now been turned into a restaurant. 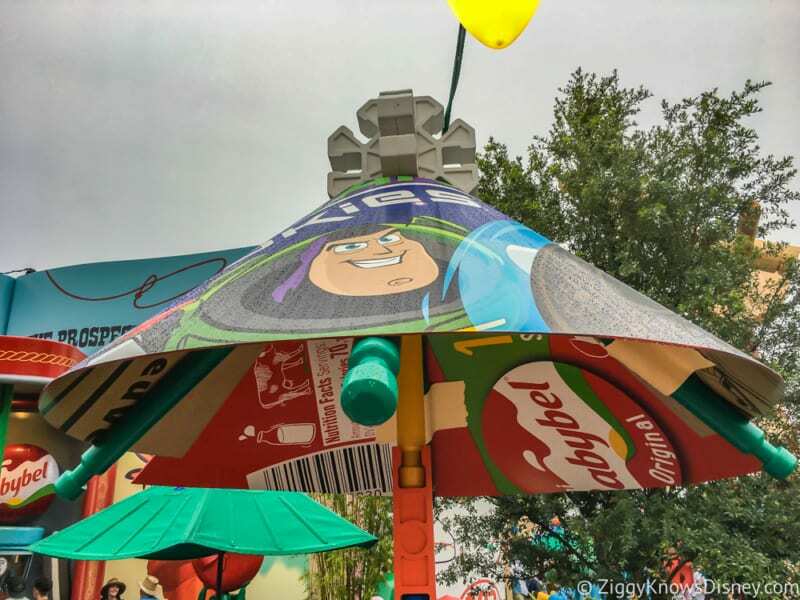 Expect sandwiches and all the food your mom packed you in your lunch box for school, but done in a fun and very Toy Story way. 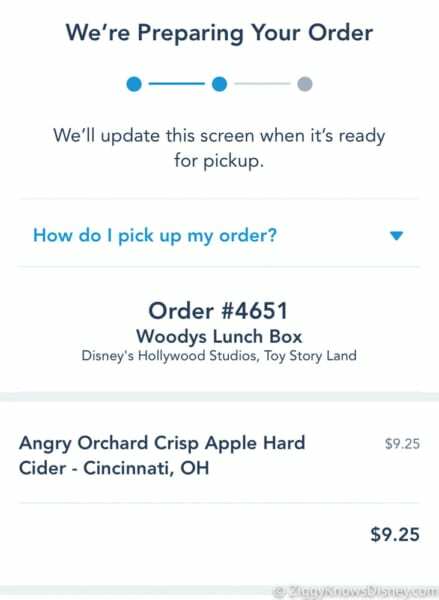 If you are using the Disney Dining Plan you’re in luck as Woody’s Lunch Box does accept it and uses 1 Quick Service Dining Credit. 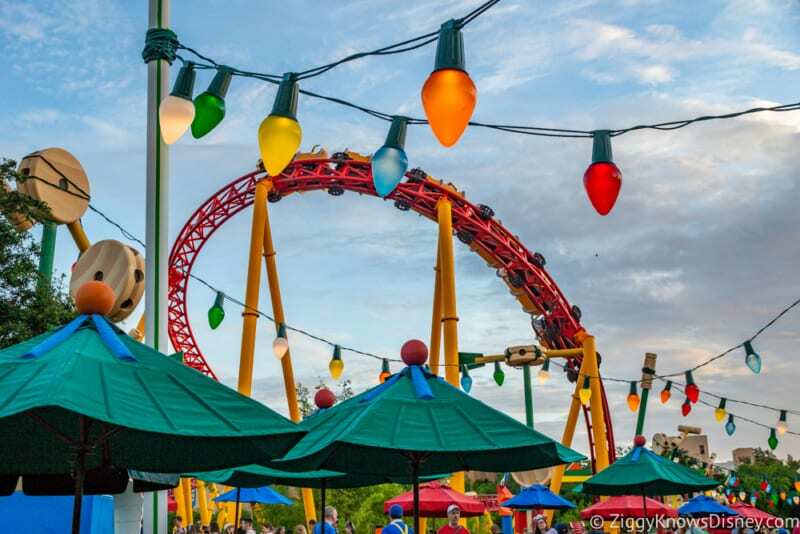 No word yet if there will be any discounts for Annual Passholders or Tables in Wonderland. 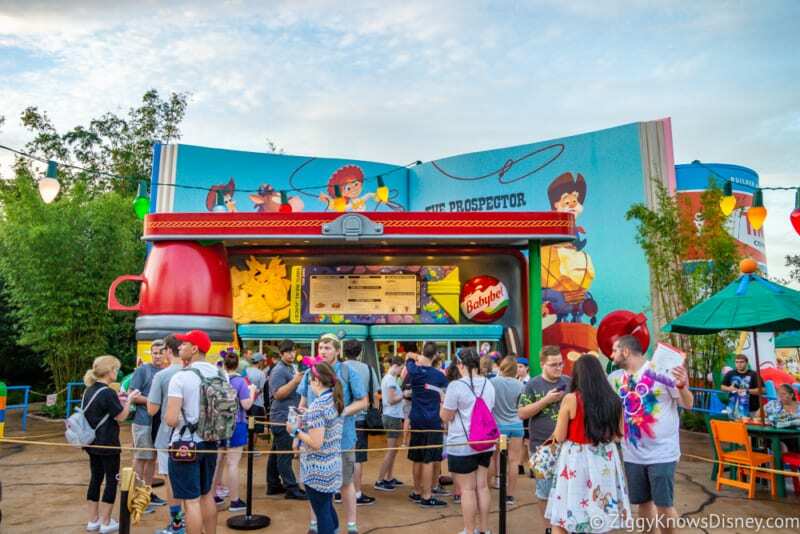 Since it’s the only restaurant in a brand new land, if you’re hungry, make a dash for Woody’s Lunch Box as soon as you get there as the lines are sure to be long. 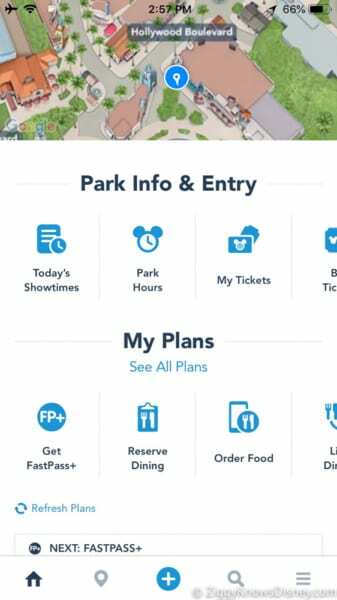 In fact to help combat this you can also use Disney’s Mobile Food Order to skip the lines by ordering your food in advance. Andy has turned his lunch box into a dining area for his toys (like you) and the lunch box is standing on its side open, propped up by a thermos. It’s super cute! 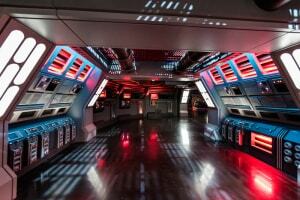 As you approach you’ll also the seating area. 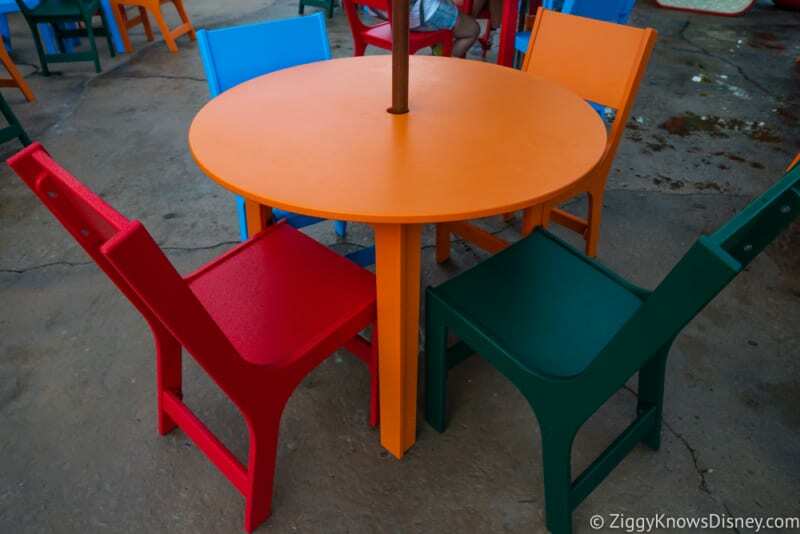 All of the tables are outside, no inside dining here. 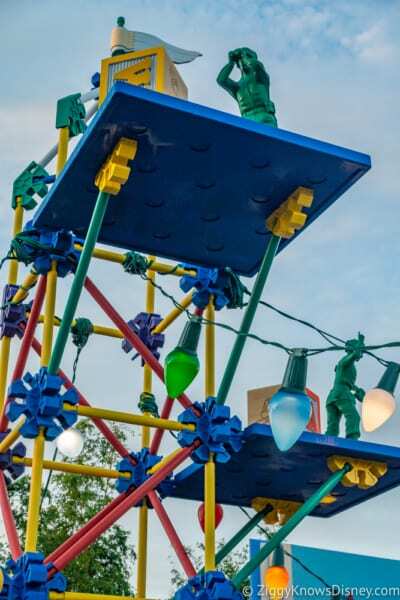 There are beautiful lights hanging over head, and a lookout tower with green army men everywhere. 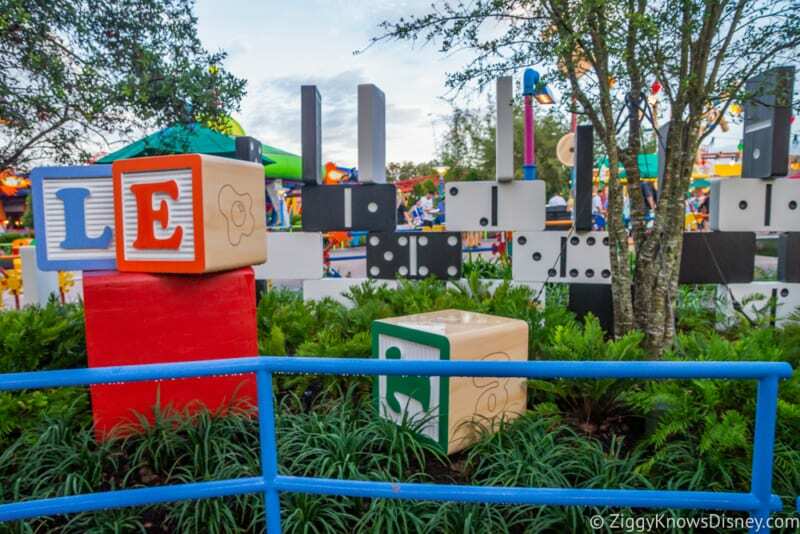 You’ll notice that everywhere you look in Toy Story Land! 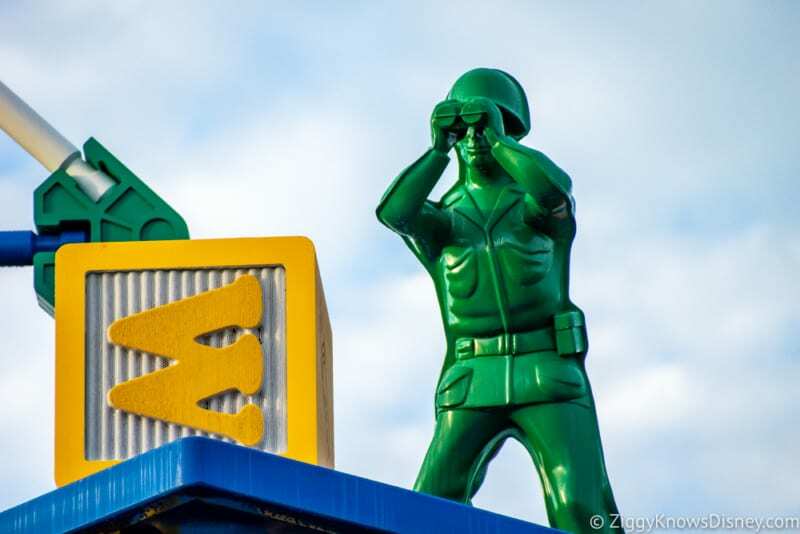 They’ll keep an eye out for Andy when he returns! 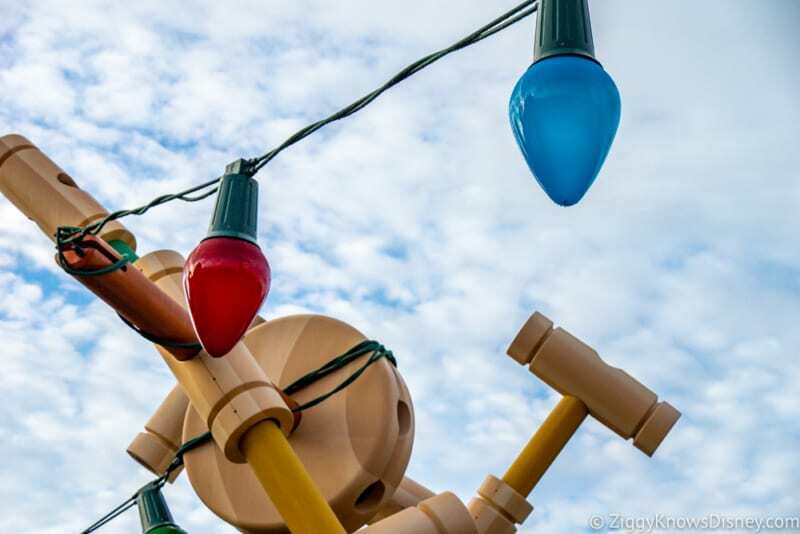 These are the standard Toy Story Land lights that are strung up throughout the land, hung on the Tinker Toy sets which also serve as lampposts and speakers too! 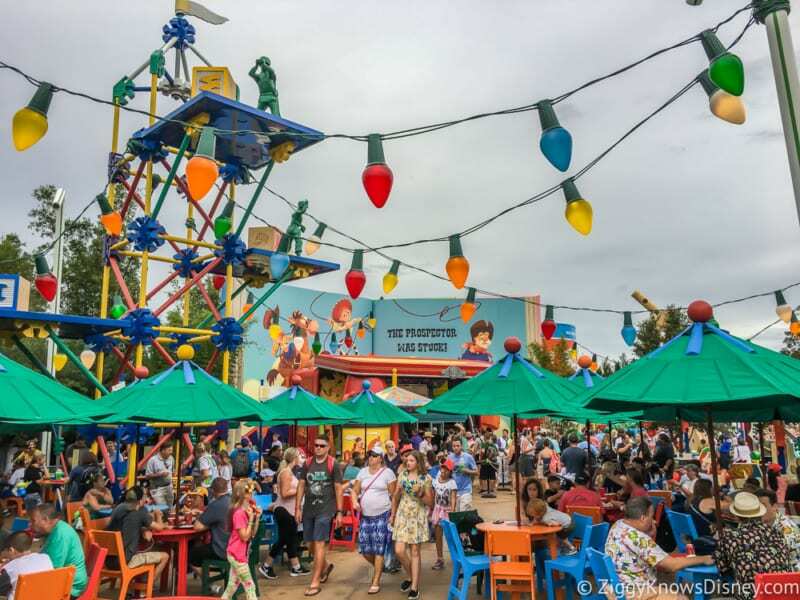 Overall the atmosphere is really cool and there are many hidden gems in the theming for Woody’s Lunch Box. 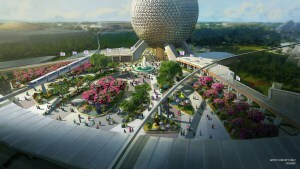 My only complaint is the lack of indoor seating and the fact it gets pretty crowded quickly. 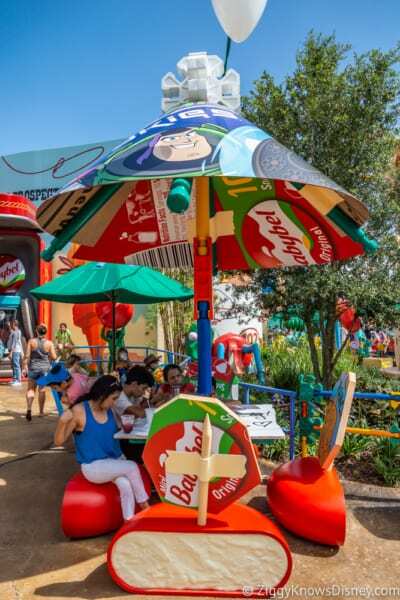 Seeing as Toy Story Land gets really hot and there are few shaded places in the land, Woody’s Lunch Box is a place where everyone takes refuge to escape the sun. They also don’t want to give up their tables very quickly so you have quite the traffic jam at the hottest times of the day. A bigger seating area and a part with air conditioning would have been nice. 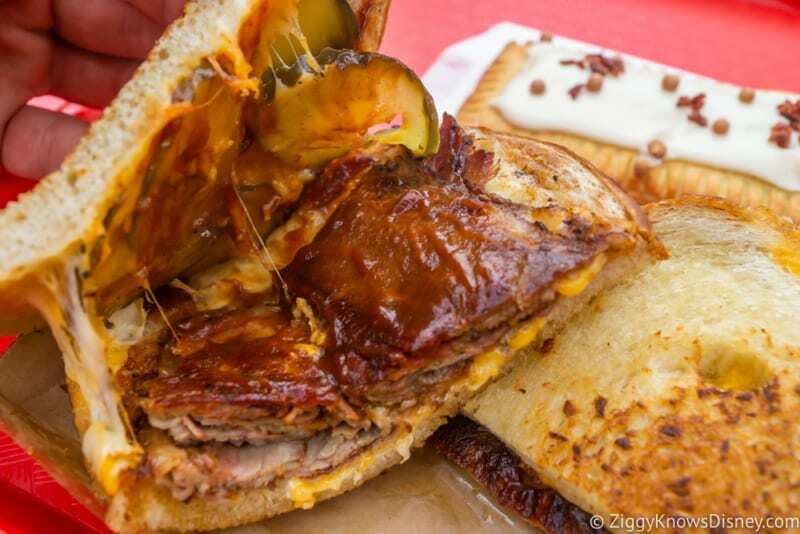 We’re hungry so let’s get into the food in our Woody’s Lunch Box review! 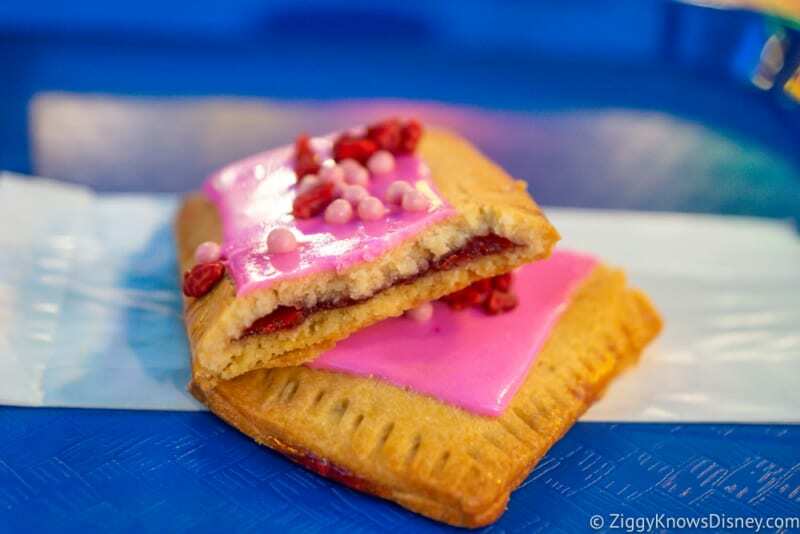 For Dessert they’re serving Lunch Box Tarts both in Raspberry and Chocolate Hazelnut flavors. 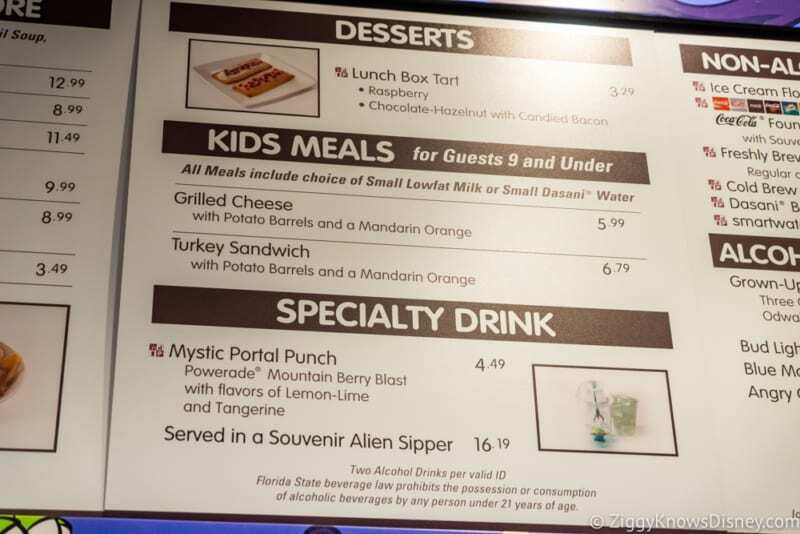 There are also options for Kids as there’s a Grilled Cheese and Turkey Sandwich. 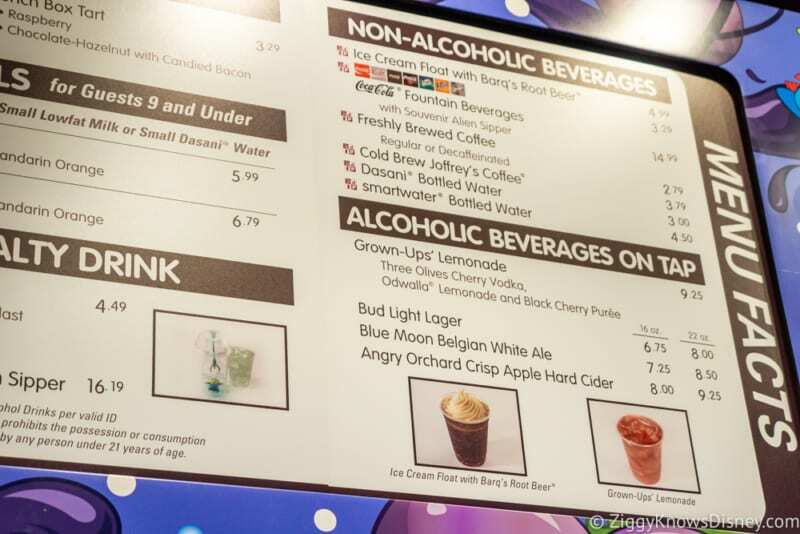 There are lots of drink options available at Woody’s Lunch Box, both Non-Alcoholic and Alcoholic kinds! 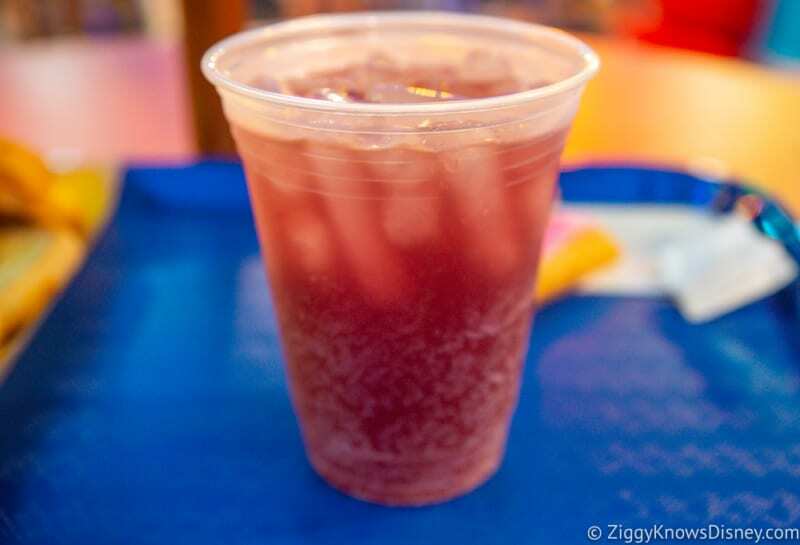 Of course you’ll find your traditional soft drinks, but they also have Freshly Brewed Coffee, and Cold Brew Joffrey’s Coffee which is better on a hot day like when we were there. 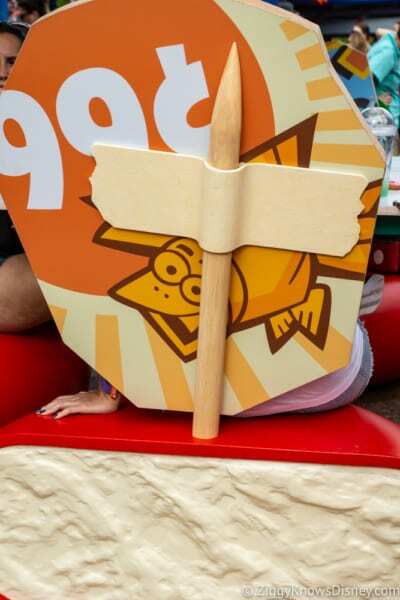 For a lot of the Opening weekend of Toy Story Land the Mobile Food Order wasn’t working but we kept trying and eventually were in luck. Once you select your food, you place your order. 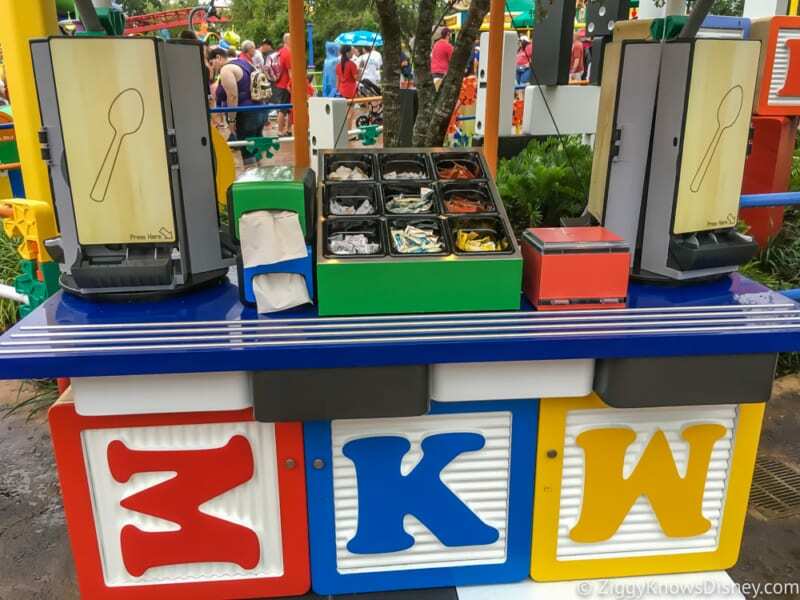 You then wait until you are ready to eat and Click “I’m Ready.” We found it only took a couple minutes from when we said we were ready which really saved us time considering the lines for Woody’s Lunch Box were over 1 hour at times. 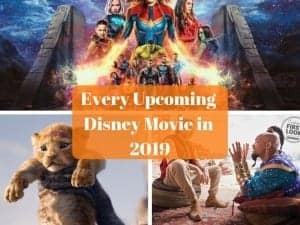 If it doesn’t work for you right away be patient as the system has been pretty loaded since Woody’s Lunch Box is so new. 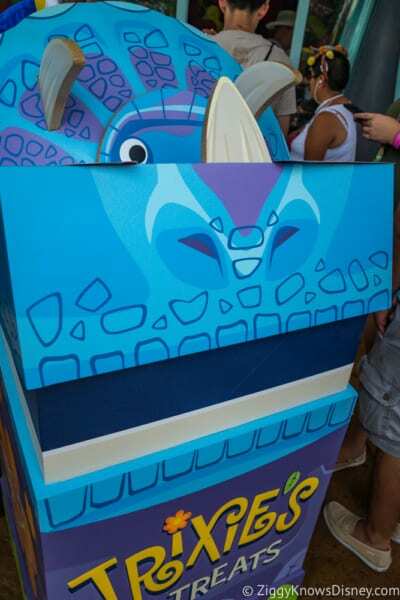 Maybe it was because we were really hot, but we really loved the Mystic Portal Punch. 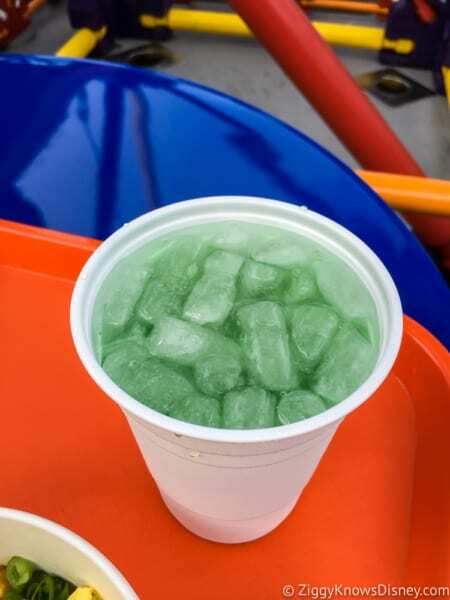 It was POWERade® Mountain Berry Blast with flavors of Lemon-Lime and Tangerine and I thought it was very refreshing. I love citrus flavors anyways so to me it was the perfect refreshing soft drink. Plus that Powerade is a good choice when you’re out in the sun all day. 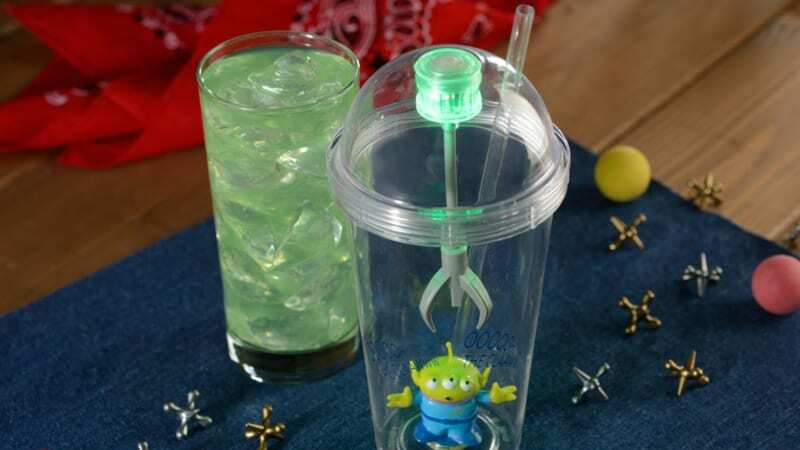 We didn’t get the Alien Sipper because we’d already purchased one before without the drink. 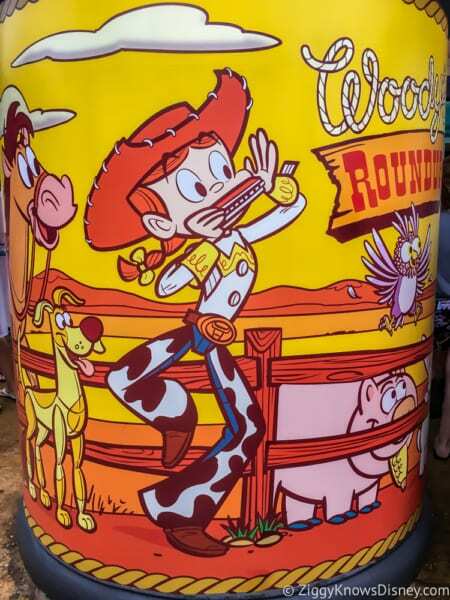 This was my favorite drink at Woody’s Lunch Box! I LOVED it! Vodka and lemonade are a killer combo to me and cherry is one of my favorite flavors, so to put them together was killer! It was a bit on the sweet side so beware of that if you don’t like sweet drinks but we thought it was amazing! We of course sprung for the 22oz as it was only a dollar more and we were really thirsty. I like hard cider and thought this also was an exceptional version. Recommend it! 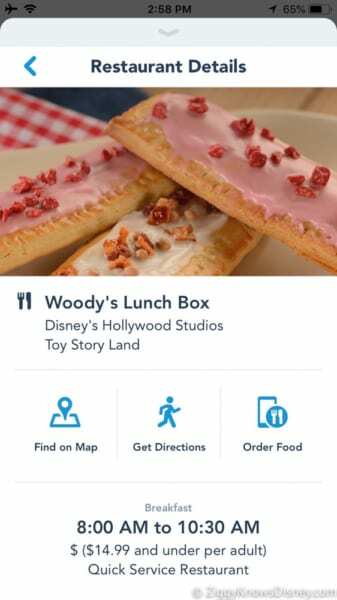 Now let’s get to some of the food from Woody’s Lunch Box! 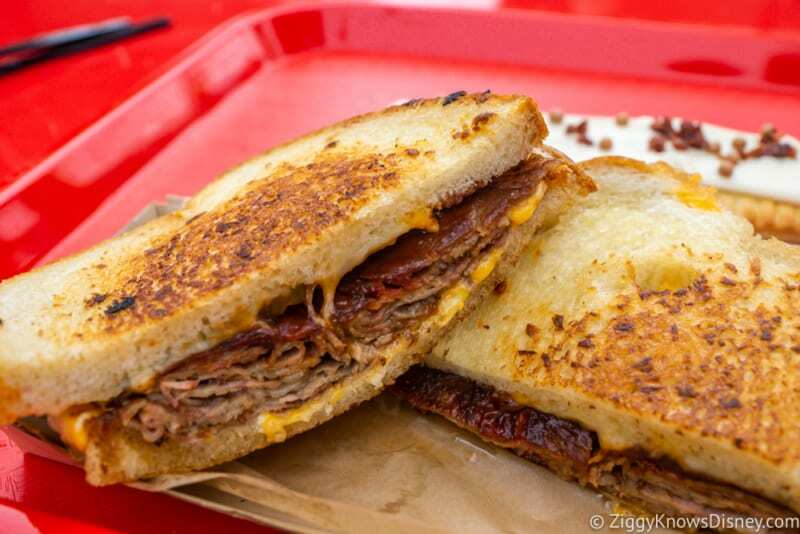 This had Sliced Smoked Brisket, Pickles and tangy BBQ Sauce with melted Cheddar and Monterey Jack Cheeses and served on Grilled Sourdough. I’d had my eye on this since the first Woody’s Lunch Box menu came out and I just had to try it. I really enjoyed it. The brisket was sliced very thin and had a smokey flavor. 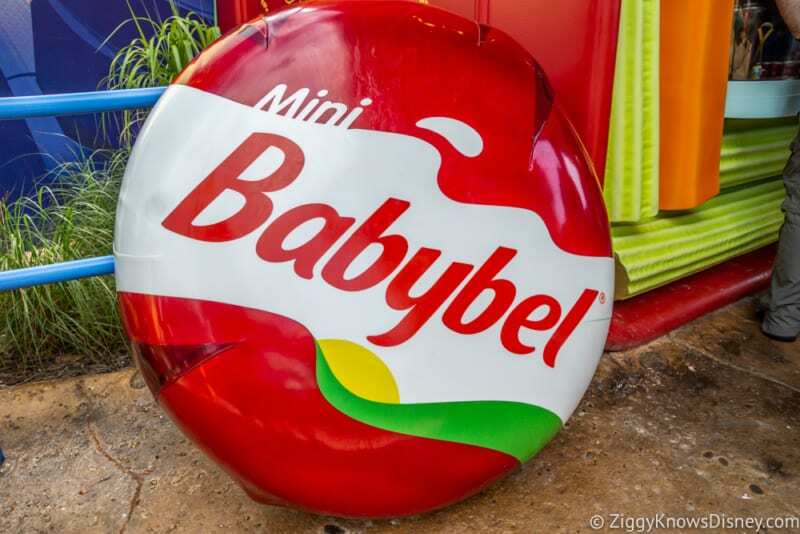 I thought it had a nice flavor and loved the cheese with it. The bread was also really amazing, cooked perfectly. I’m not a huge pickles guy on sandwiches so next time I’ll ask for it without them, I thought it made the sandwich too sour tasting. But if you like pickles then go for it. This sandwich like all fo them gives you the choice of Soup, Macaroni Salad or Potato Barrels, but we keep getting the soup. 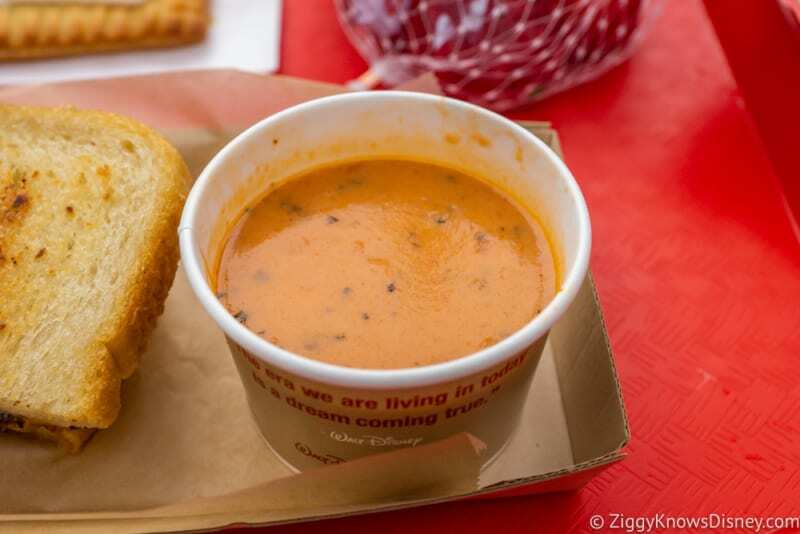 It’s a Tomato-Basil Soup and it had a rich creamy texture, not watery. 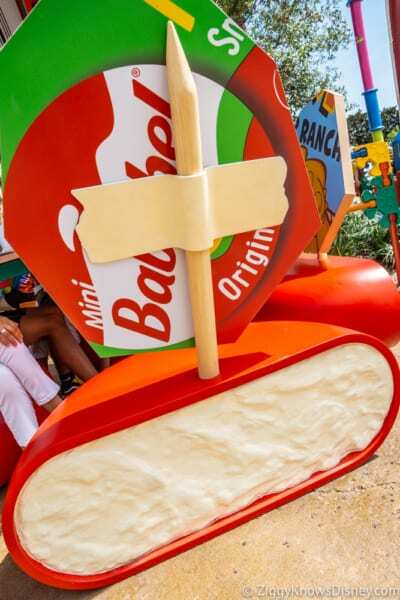 Both the tomato and basil flavors were very distinct and our only complaint is they didn’t give us enough of it!! 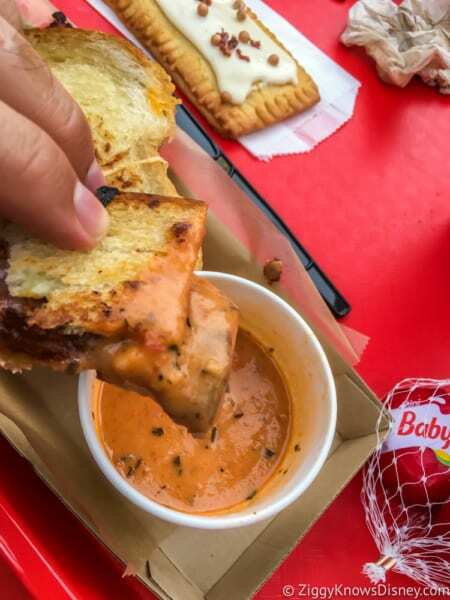 We thought it was the perfect compliment to our sandwiches and we kept dipping them in! Love the soup as a side and highly recommended it! 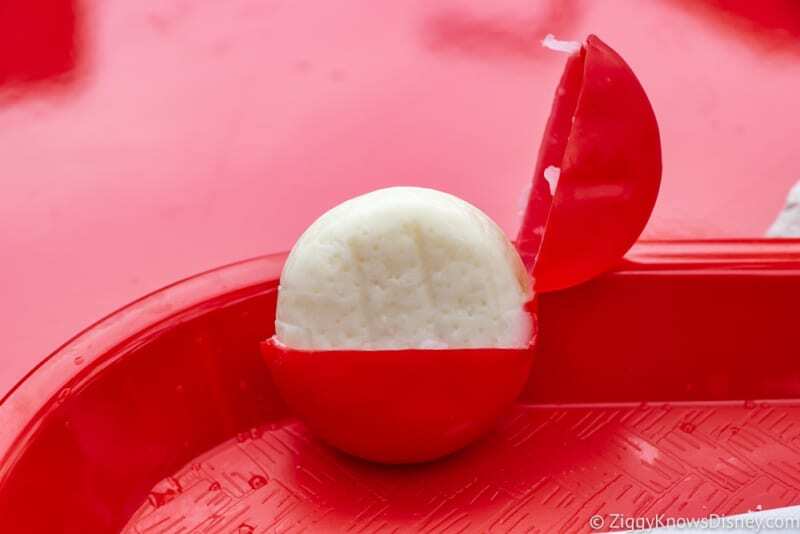 This was the first thing we tried and we were totally blown away. First of all it comes served on a Garlic Buttered Grilled Artisan French Bread, yeah let that sink in for a minute. The bread was perfectly prepared, perfectly crispy but not to well done and had a slight garlic/buttery flavor what was perfect! 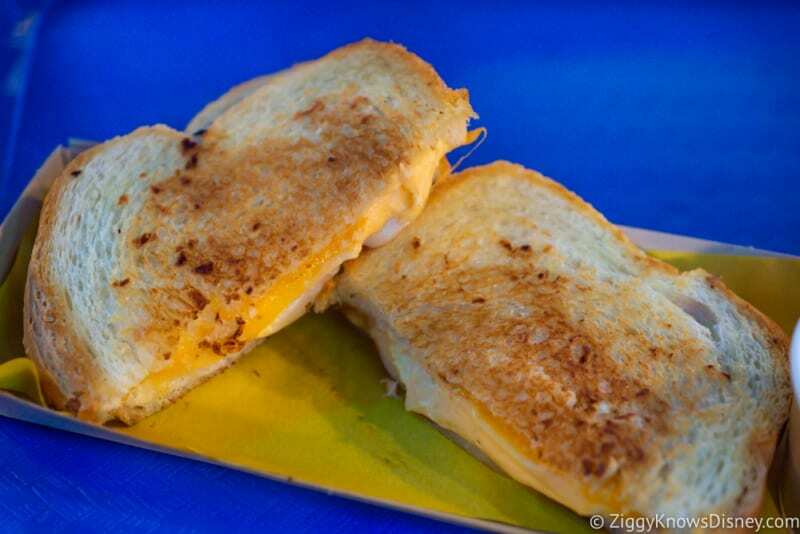 inside it had a 3 cheese mix: Provolone and Cheddar Cheeses with a Cheddar Cream Cheese Spread which were insanely good. Super stringy and creamy. 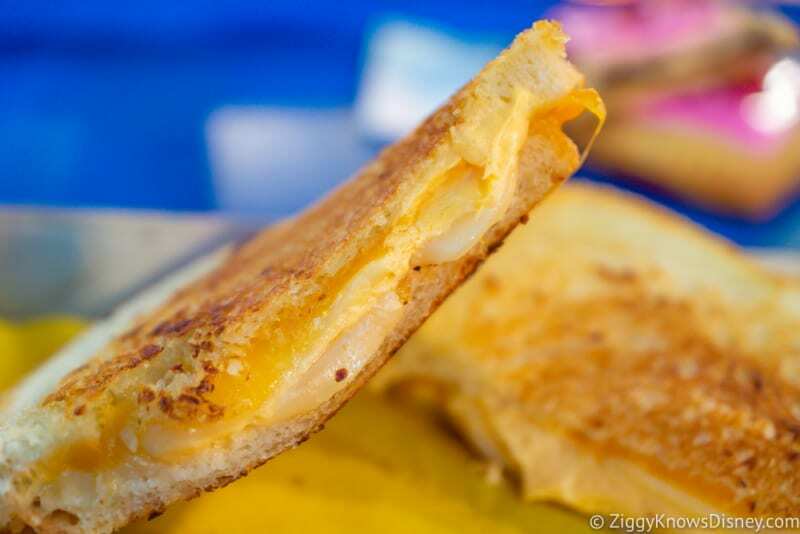 Look at all that cheesy goodness…. Again we got it with the soup and were dipping away!! At $8.99 it’s an affordable cheap item and possibly my favorite thing on the menu, until I tried these…. So even though it sounds good, I was a bit skeptical before trying the Totchos because it just doesn’t sound very inventive. I mean they keep calling tater tots “potato barrels” like they’re something new and exciting. Still if you smother anything in cheese and chili it’s probably going to be half decent…and this was that, and then some! First the portion size is HUGE. They give you a really big sized bowl of them that you can eat for a whole meal if you want. 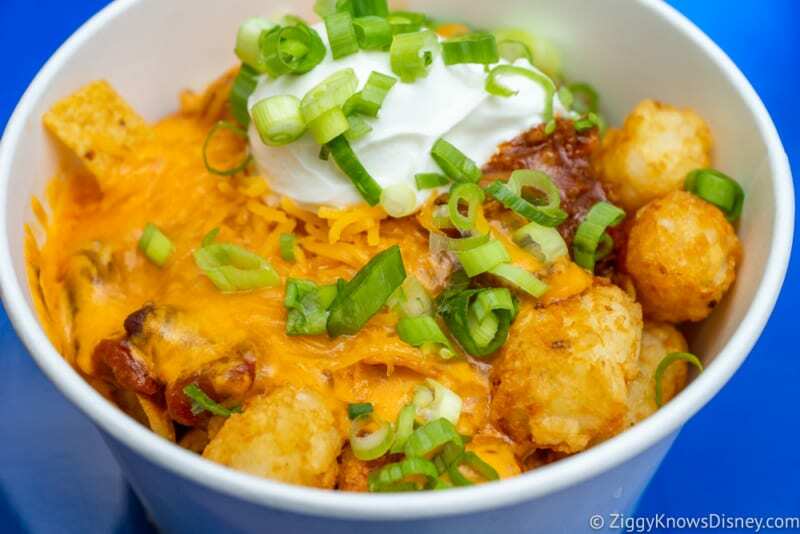 Totchos are a play on words of Nachos and like their relative they are smothered in a Beef and Bean Chili, Shredded Cheese and signature Queso with Tomatoes and Corn Chips, Green Onions and then topped off with a huge dollop of Sour Cream. 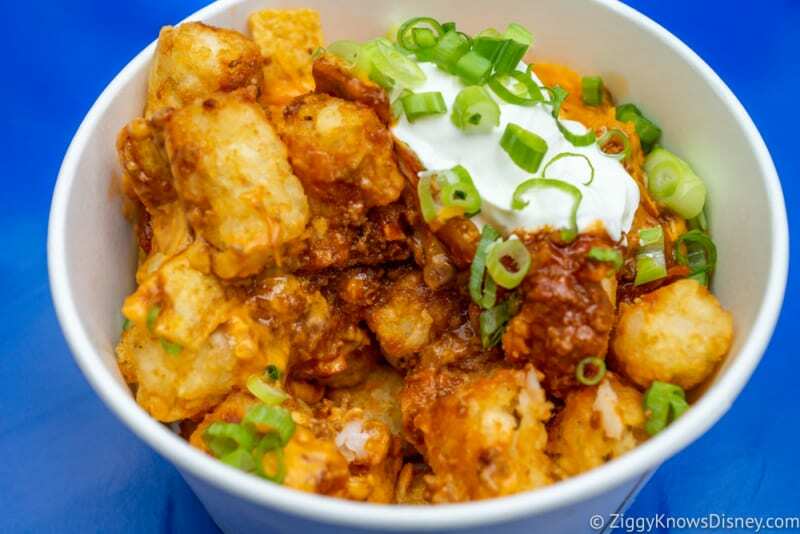 But all the toppings weren’t just on top, they were layered down throughout the Totchos. The chili was really delicious, not spicy of course, but the meat was very savory. There was an abundance of cheese and queso and when you mix everything with the sour cream it is an unbeatable combo. Eventhough we weren’re super hungry by this point we couldn’t stop devouring these things and for sure it’s going to be a must-get every time we go to Woody’s Lunch Box! 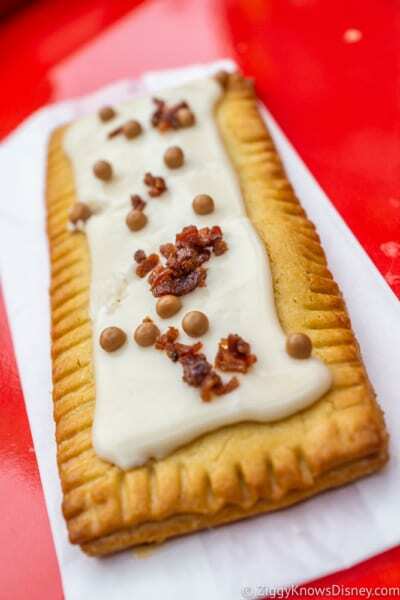 Woody’s Lunch Box offers 2 signature desserts: Lunch Box Tarts, and can be had either at Breakfast or Lunch/Dinner. They are available in 2 flavors: Raspberry and Chocolate-Hazelnut, both of which are made fresh in-house! 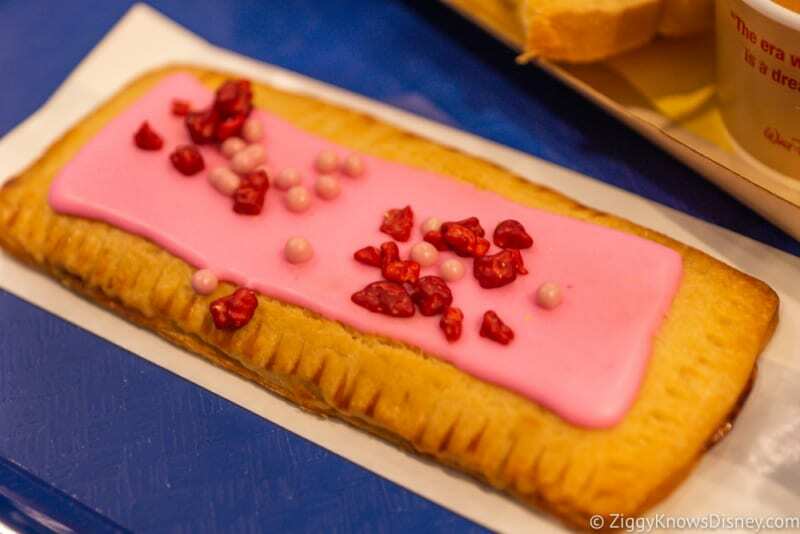 This one has Raspberry Marmalade and coated in a Strawberry Fondant with Crispy Pearls on top. We love everything raspberry so this was our first choice, and it was the right one. It was incredible!! 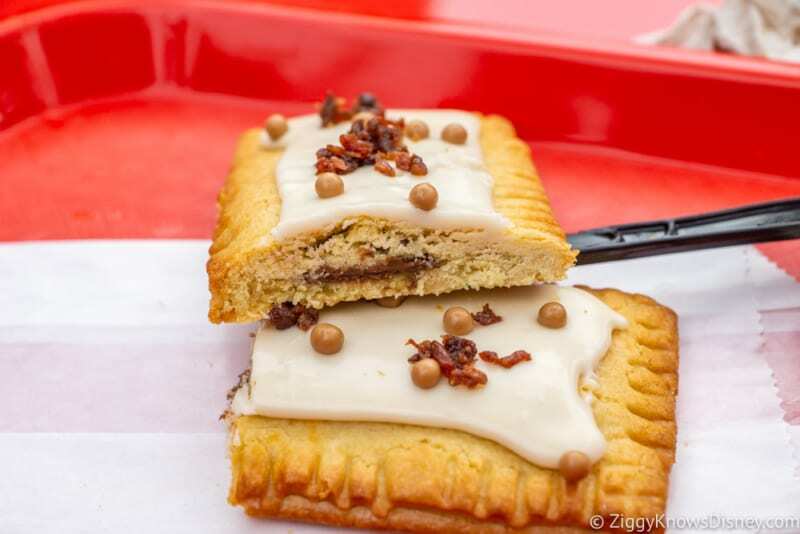 The pastry is a bit thicker than a normal pop-tart and you could tell they are made fresh. There was a good amount of raspberry jam inside and it was not too sweet. Liked the crispy pearls on top which were like puffed rice. We’re also big Nutella fans (which is essentially what is inside) so we also couldn’t wait to try this one! 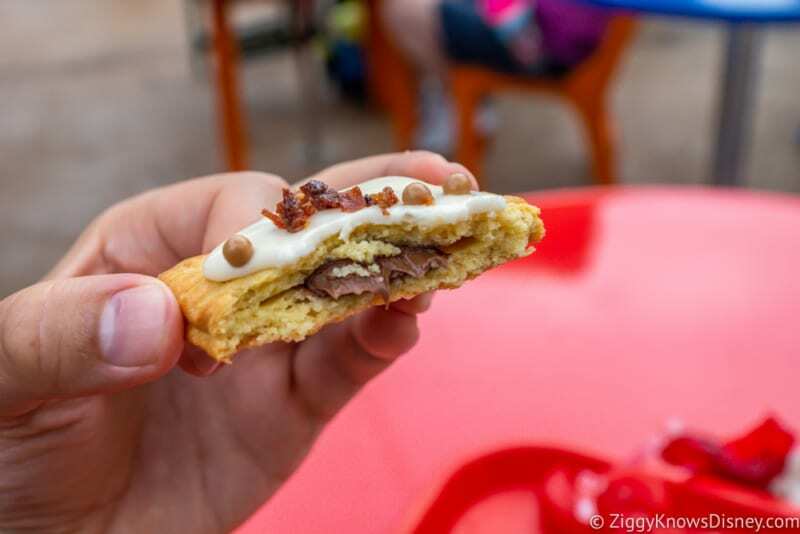 It’s the same pastry but stuffed with Chocolate-Hazelnut and coated in Maple Fondant and Candied Bacon. 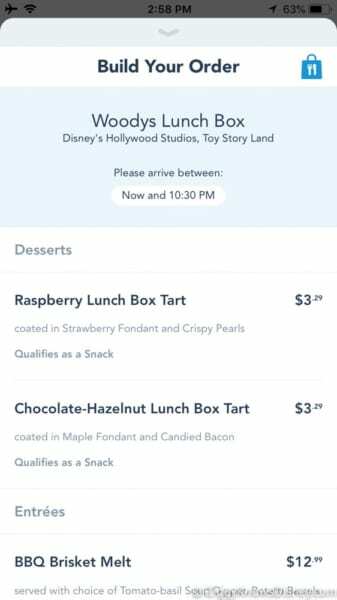 I’m not the only one, literally every person I talked to at Woody’s Lunch Box said they preferred the raspberry to the chocolate-hazlenut one. I think the problem was there was less stuffing in this one which made it a bit drier. 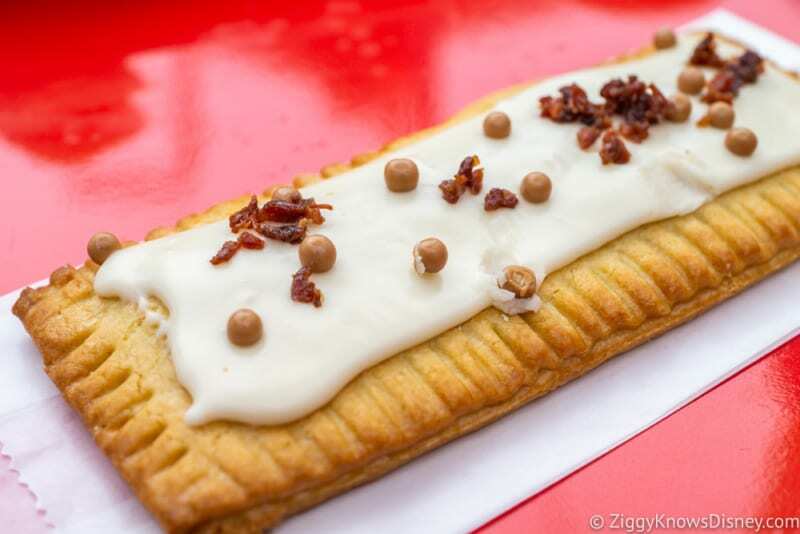 You also couldn’t really taste the maple that much, nor the bacon. 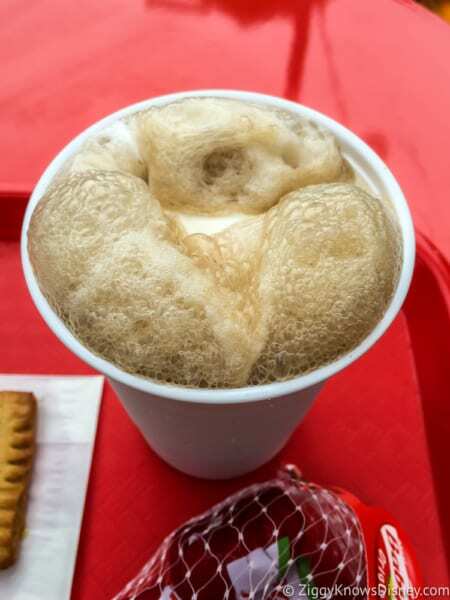 Pretty straight forward, this is Barq’s Root Beer with Vanilla Soft Serve, but who can say no to that?? Another winner in my book as I never turn down a root beer float and the combo of ice cream and root beer was just what we needed to beat the heat! 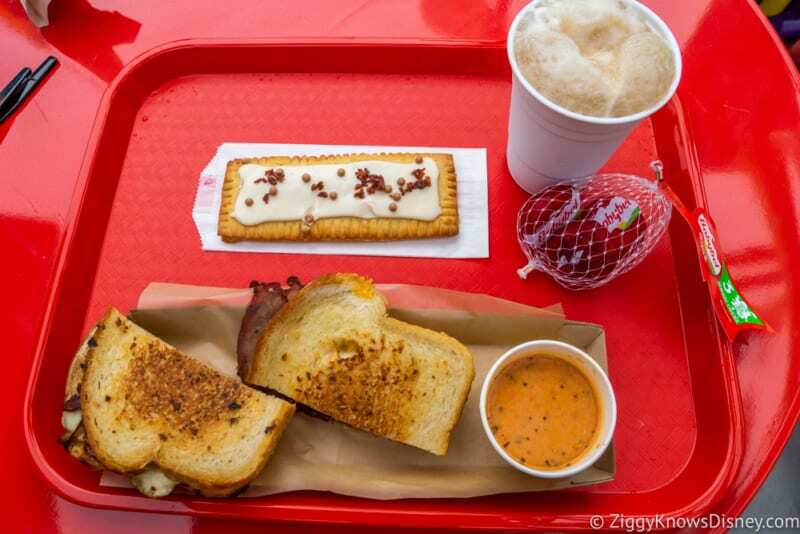 We enjoyed pretty much everything during our Woody’s Lunch Box review, and had a fantastic experience. 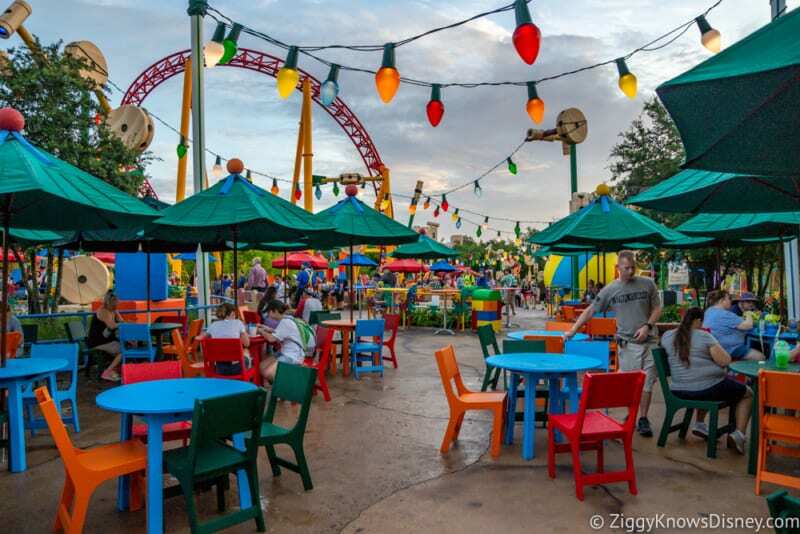 The atmosphere was what you’d expect from a dining location in Toy Story Land and there were a bunch of really cool and even hidden theming elements to find. You could spend a long time just studying it all and it was really fun! 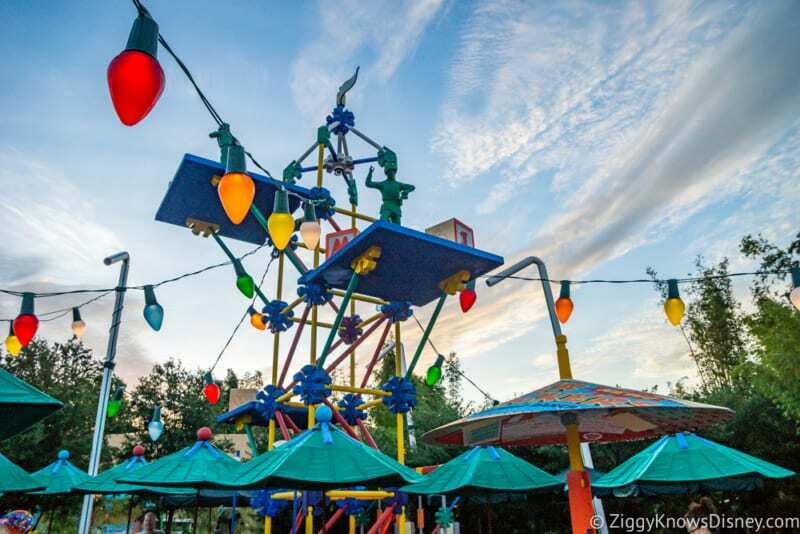 It fits in really well with the overall theming of Toy Story Land. Again I’d have included some more tables and a section which has air conditioning but I understand because of size restrictions it wasn’t possible. 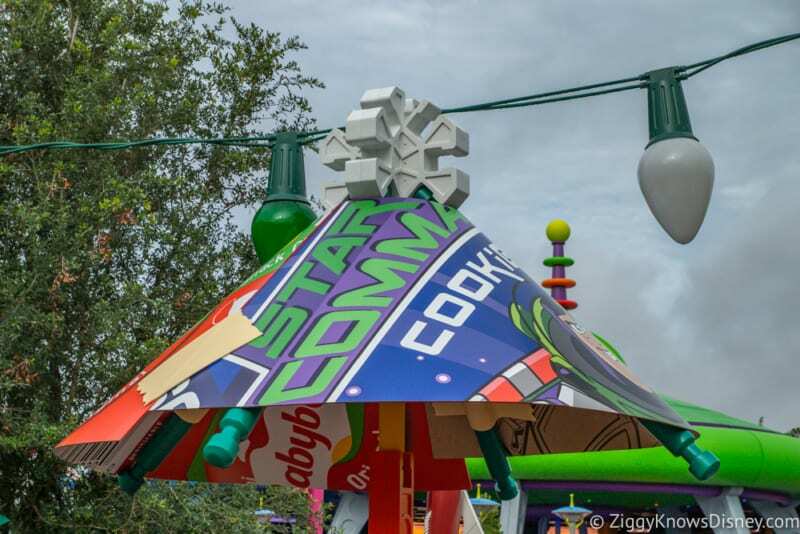 And I caution guests to be patient for a while because the lines are sure to be long. 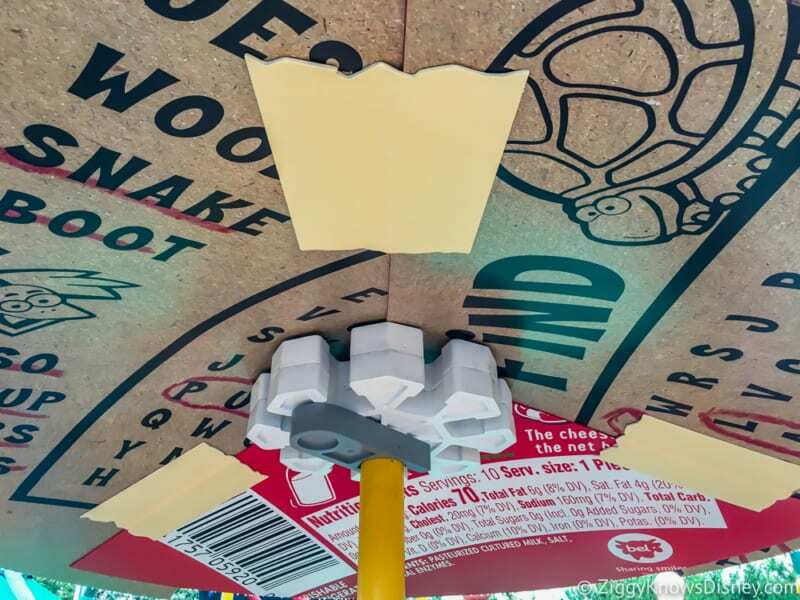 Try and make use of the Mobile Food Order and you’ll save a bunch of time! 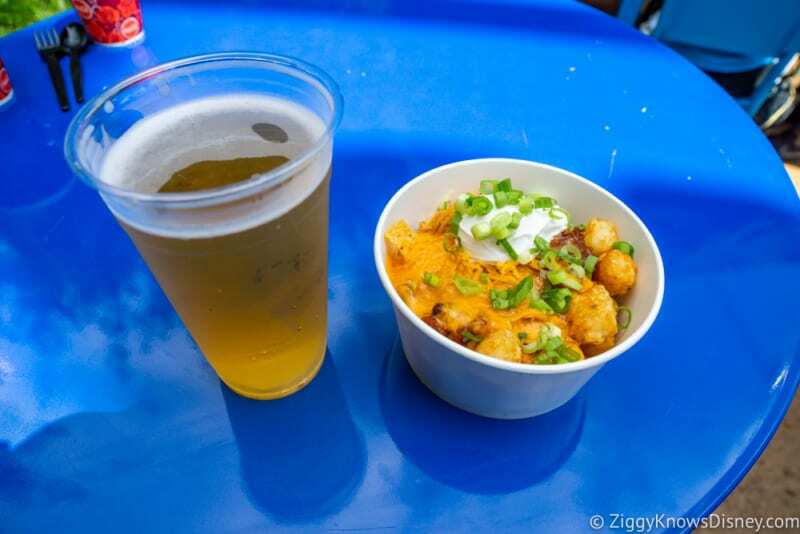 The food was incredible and something out of the norm when talking about Disney parks quick service dining. All of the sandwiches we tried were amazing, and much better than I was thinking ahead of time. 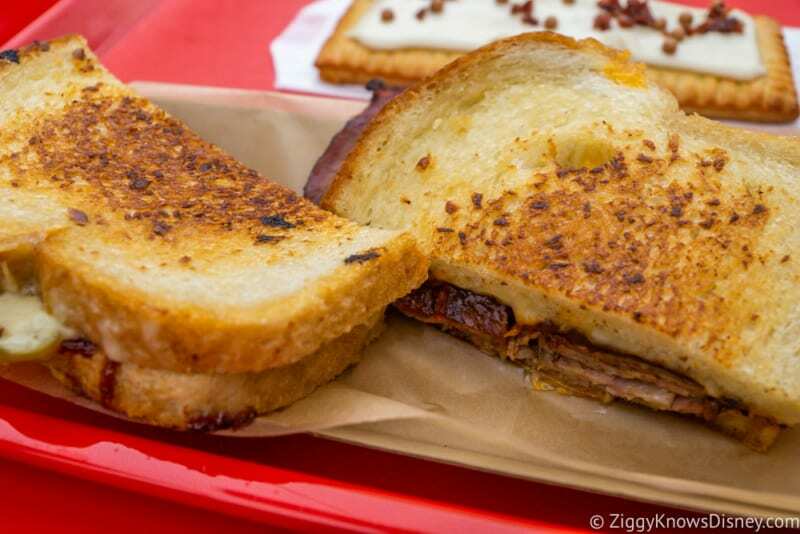 The Grilled Cheese really blew my mind and I’ll definitely get it again. The Totchos were also unbelievable, and one of the best quick service meals available. 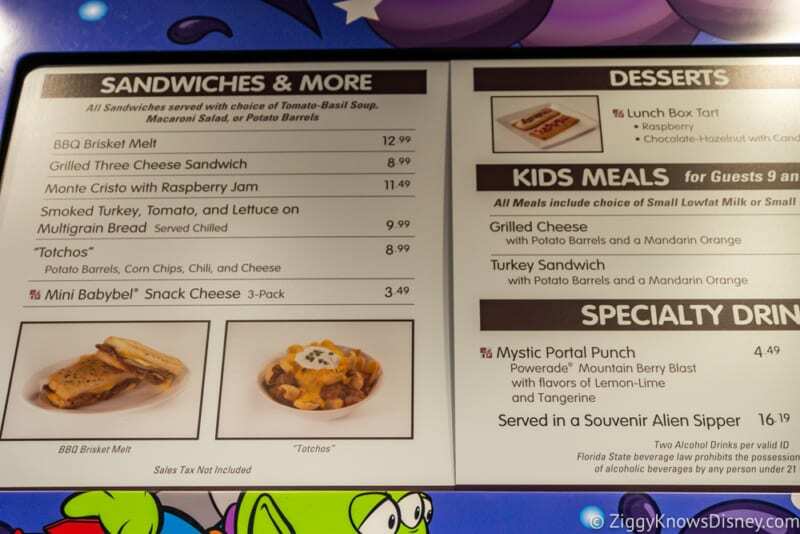 All of the menu items also offer a pretty decent value for the money, which is a rarity in Walt Disney World. 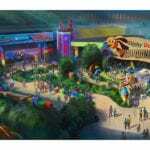 Disney keeps getting better and better and has another winner after opening Satu’li Canteen in Pandora last year. 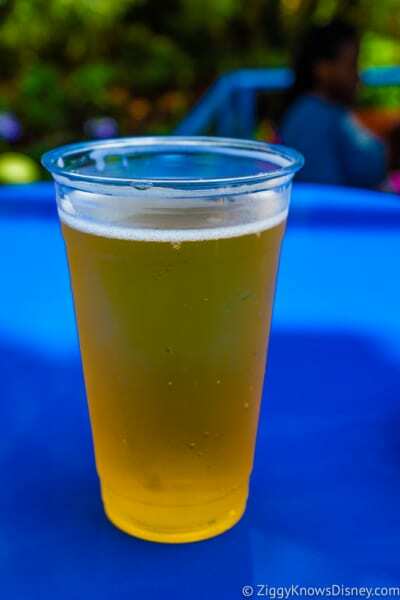 I don’t know if this is quite as good as Satu’li Canteen, but it’s really, really close, and for some palates maybe better. 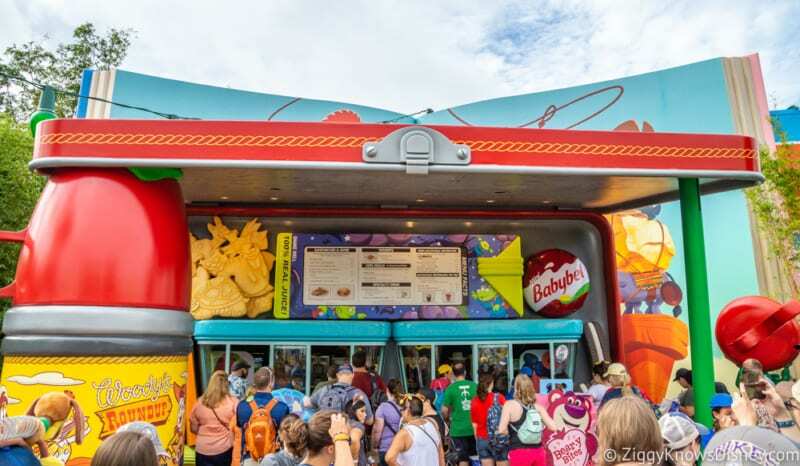 It’s for sure the best quick service dining location in Hollywood Studios and it’ll be interesting to see how high up it is the next time we rank the Best WDW Quick Service restaurants…Top 10 for sure. 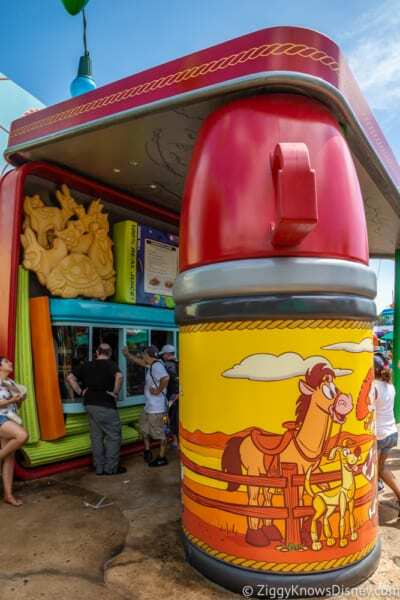 We loved Woody’s Lunch Box and I think it’s the best thing about Toy Story Land, whether that be a good or bad thing, you decide. 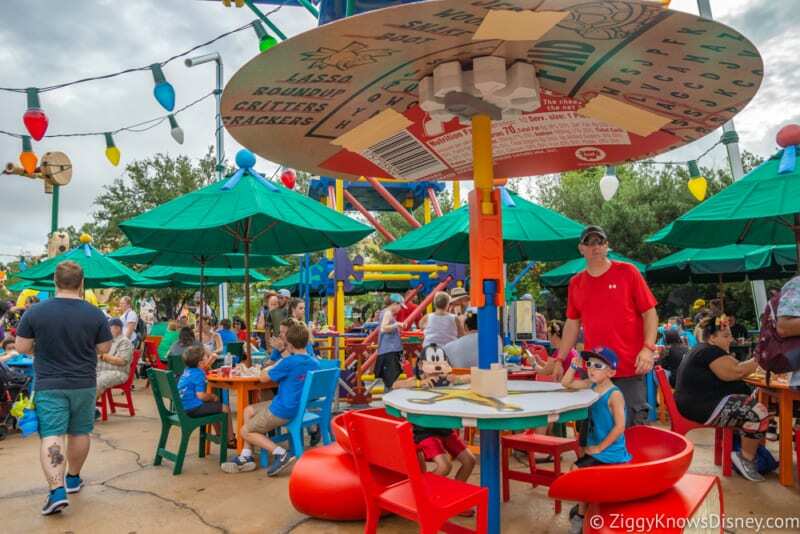 Woody’s Lunch Box is open for Breakfast, Lunch and Dinner (Park Opening – Park Closing (Hours vary depending on the season). 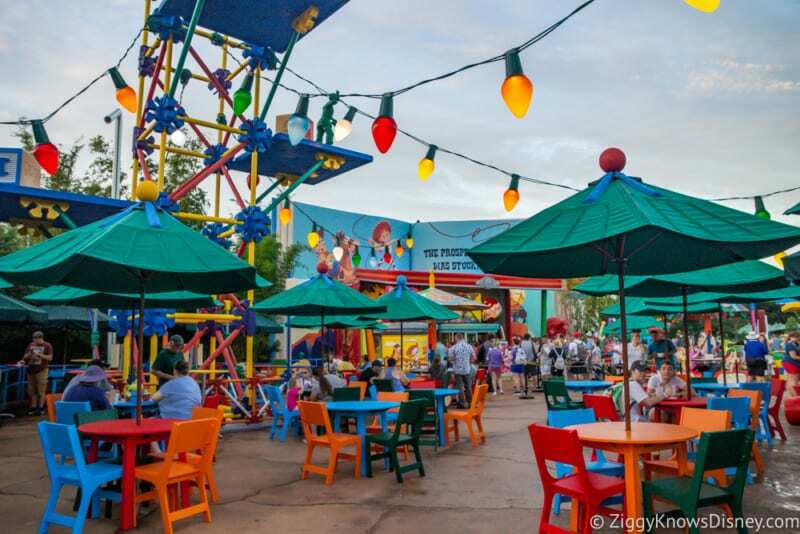 The Disney Dining Plan is accepted, it’s a 1 Disney Dining Quick Service Credit. 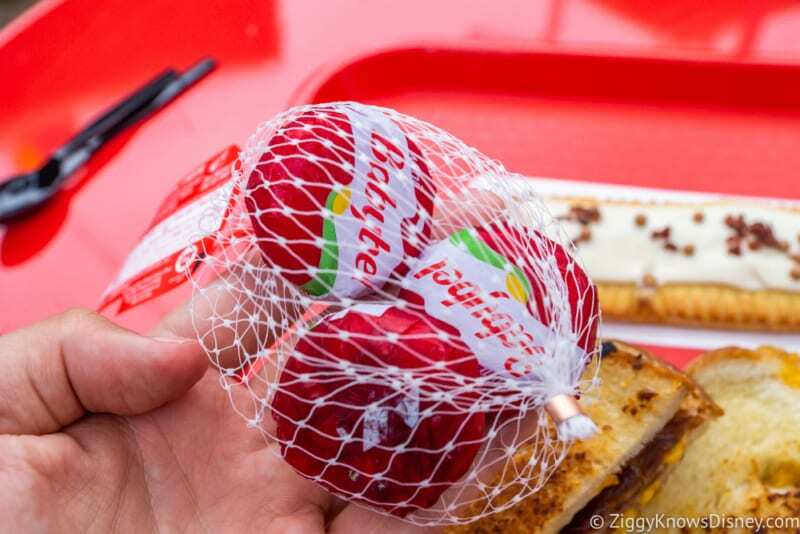 If you are looking for a Review of Woody’s Lunch Box Breakfast then click here. 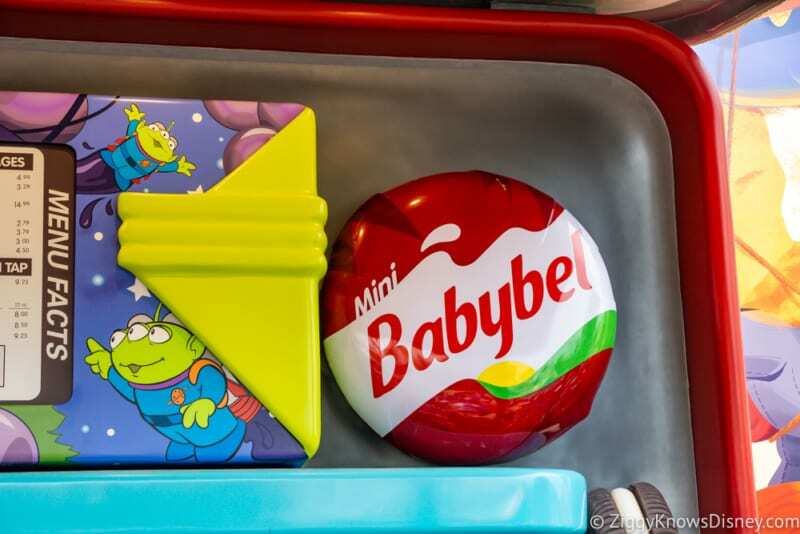 What are your thoughts on Woody’s Lunch Box?